Place the sugar into a heavy bottomed pan and melt to form a caramel. Once all the sugar has melted, remove the pan from the heat and add the diced butter. Combine well and then return to the heat and add the cream. Mix to form a smooth, even caramel. Pour the caramel into small silicone moulds or an ice tray and place in the freezer. Beat the eggs and the sugar until pale and fluffy. Place the butter and the chocolate in a heatproof bowl and melt together. Gradually add the flour and the chocolate to the egg mixture. Line stainless steel serving rings with baking parchment. Fill the moulds three quarters full with the chocolate mixture and then press a piece of caramel into the centre of each chocolate pudding. Place the raspberries and the icing sugar in a food processor and start blending. Gradually add the the water until you have a liquid coulis. To serve: carefully remove the fondants from their moulds. Add a spoonful of raspberry coulis to each serving plate and spread it out with the back of a spoon. 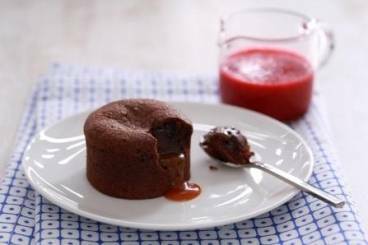 Place a fondant on top of the raspberry and serve immediately.